Ok, when I get bored, baking happens. I've had this recipe for probably a year now, maybe two or even three. It taunted me. 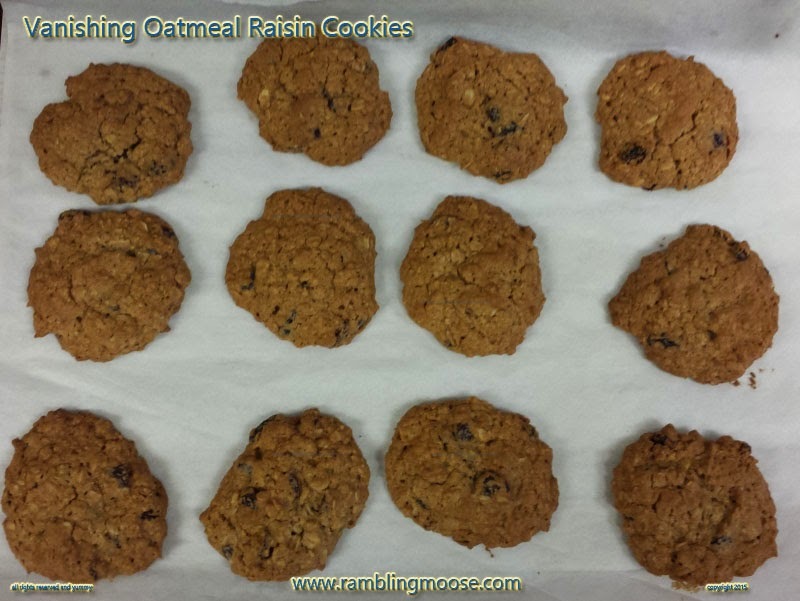 Oatmeal Raisin Cookies are one of those things that I do in fits and starts, and even then I have been somewhat disappointed with the results. I've found some really strange recipes out there. One even substituted butter flavored shortening for the butter in the cookies and you end up with something that would survive the fall of mankind since there isn't any real food in that recipe. This recipe? It's as good as it gets as far as I am concerned. These cookies are really That Good. Soft and moist inside, tasting richly of warm cinnamon and sweet raisins. Guess what? I used the recipe from the Quaker Oats Cylinder. Really. I'm finding when I want to try something, the recipes off of the "bulk" food containers are usually the best. They're tested, they're "approved" and while they do tend to maximize the use of "their product", I have never had a problem with them. In this case, the "Quaker Oats Vanishing Oatmeal Raisin Cookies" recipe was as good as promised. I had to restrain myself from attacking them. 1) 30 grams of cookie makes a 105 calorie cookie on average. 28.3 grams to the ounce. Next time I will make a 29 gram cookie for a 101 calorie cookie. Why the nonsense about the measurements? The instructions say "Drop by rounded teaspoons onto ungreased cookie sheet". I wanted measured cookies that were all the same weight and calories. It is my own preference. 2) I omitted salt. I don't like salt in my foods. Again my own preference. I did, however, use a good quality Salted Butter simply because it was what I had on hand. I'm thinking it balanced out. 3) I'm American. Born and bred in South Jersey. So for my Overseas and Non American readers, and there are quite a few, I will try to use both Imperial and Metric Measurements. They are not strictly speaking Imperial any more since we sell beer in weird measurements, but that would be a bit pedantic. If you are Metric and want to give this a go, look over my shoulder and verify my conversions from Imperial to Metric. The chart I used for the conversion is here. Bring your own calculator. 4) Oats. The recipe calls for Rolled Oats or Quick Oats. Not the Steel Cut "Irish" or "Scottish" style oats that come in the can. The quick oats are almost a powder, but not quite. 5) I baked on parchment paper. When they came out, I merely lifted the parchment up and allowed the whole sheet to cool on an "empty" counter. If anything can be called empty in a kitchen! 6) Make These Cookies! They're excellent if you like a good Oatmeal Cookie. Or biscuit as they say in The Commonwealth. They really are That Good. 1/2 Pound (227 Grams) Softened Unsalted Butter, Salted Butter, or Margarine. 3 Cups (255 Grams) Rolled Oats or Quick Oats.